Suspenseful moments, face-huggers, aliens, gore, and good characters all mix well here as Scott explains some of the events in PROMETHEUS that are still relevant now with the help of writer John Logan (GLADIATOR, SKYFALL), as we get a double dose of Michael Fassbender this time around as the previous droid David and now newly improved droid Walter as he helps the crew of the Covenant, which is a ship headed to a planet to colonize with a ton of frozen embryos and humans in hyper sleep to help settle in on the new planet. When they get a signal from a nearby planet that looks to be habitable, the crew heads there, only to find David and some nasty aliens. The suspense is slow-building, but will have you on the edge of your seat for sure in certain moments, and will bring you back to the 1980’s in its feel and tone of horror. The characters all have potential, but aren’t given enough time to really get meat of them. Danny McBride as Tennessee, the pilot of the Covenant is the comic relief, but also holds his own in suspenseful situations. Billy Crudup as the first mate of the ship brings a good balance of someone you love and hate when he’s on screen. Katherine Waterson plays Daniels, a terraforming expert and bares a huge resemblance to Sigourney Weaver’s character from the original ALIEN films. However, just like her performance in FANTASTIC BEASTS, she’s stale and uninteresting in every scene. The real spotlight is on Fassbender here, playing both droids, who you’re never really sure of. Both of his accents are spot on and his mannerisms are eerily calculated. Then again, Fassbender is always amazing. The explanations of the aliens themselves and seeing them evolve is quite spectacular with some truly terrifying scenes with some great blood and guts scenes that should satisfy the horror hounds. There are a few slow moments throughout, but it’s never filler for the next scene. It’s just part of this new slow pacing that drives up suspense. ALIEN: COVENANT is the step in the right direction we need with these films. Now if we can just get back Sigourney Weaver as Ripley, then we can have our freak out. 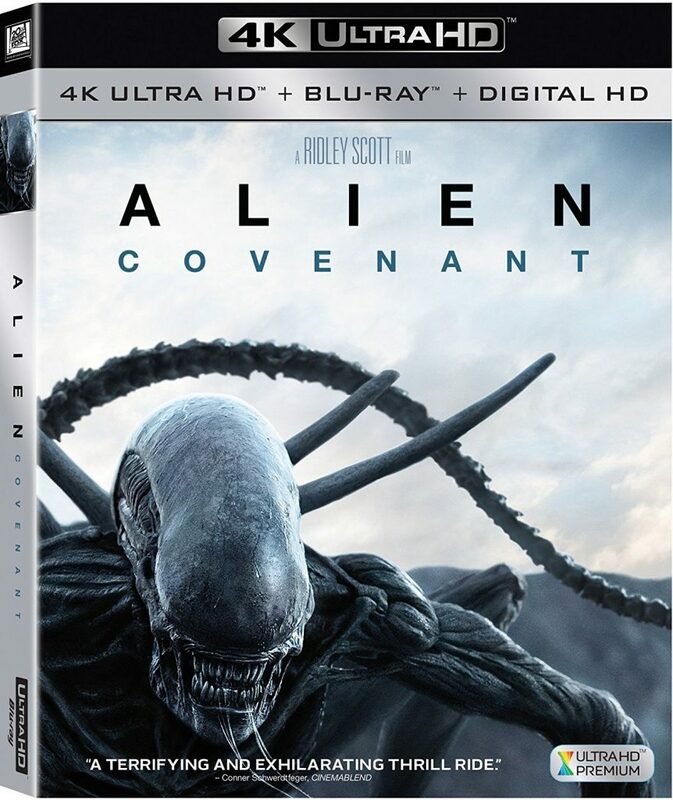 The Video: Alien: Covenant comes with a 2160p transfer and is presented in 2.40:1 aspect ratio. This is a solid upgrade from the standard Blu-ray version for sure with finer detail and better colors. Don’t get me wrong, the Blu-ray looks great, but with this 4K UHD, things are enhanced quite a bit. The spacesuits show off all the rubber and leather elements with creases and dirt throughout, which looks very realistic. Individual hairs on the actor’s faces, wrinkles, and scars also show up nicely here. The gory scenes with bloody entrails and guts galore look fantastic with every gooey bit fully fleshed out. The aliens themselves look excellent here, even with their CGI limbs. You’ll be able to see their veins, teeth, and every slimy drop of their venomous saliva. The plant life on the planet look amazing with the evil spores having their own unique design and intimate detailing. When those spores travel through the character’s ear, you’ll be able to see every crease and tiny hair on his skin inside his ear, leaving spectacular detail to be seen. Wider shots look excellent as well, giving a grand view of the rocky, yet green landscape. There are a ton of shots with mist and fog in the atmosphere, which can make the picture look a bit soft, due to the heavy CGI, but it’s not a deal-breaker here. Colors are well-balanced and have a cooler look to them with enhanced greens, teals, blues, and grays to give a decayed look and tone to the story. The many different greens on the leaves and trees are deep and rich an d the many grays and blues in the sky and rocks make a nice contrast here, but never earthy or inviting. There are a few shots of yellow and orange inside David’s cave, which gives a nice glow to everything. Then there is the red blood, which is thick and bright and always lights up the scene. Black levels are deep and inky, and skin tones are natural. There were no problems with any aliasing, banding, or other video noise to speak of, leaving this video presentation with great marks. The Audio: This release comes with an intense Dolby Atmos mix, which adds even more layers to the Blu-ray’s already impressive DTS-HD MA 7.1 mix. Sound effects are well nuanced and very loud with realistic tones and blasts. The sounds of the spaceship hovering really brings the overhead speakers to life with all the debris flying around and creates a mid-air sound as if the spaceship is right in front of you. With more transition and life, the nature sounds and jet engines move freely as ships and other life fly by in the background, giving this audio presentation some good depth. The computer and mechanic sounds of the ship and it’s instruments, as well as the use of Mother is amazing, and fully engulfs every particular speaker as the characters run through the ship. It’s definitely an immersive experience. Other ambient noises of people screaming, nature sounds, or spacecraft noises are full and robust at all times. The score always adds to the suspense and tonality of the film with great dynamics. Some of the alien attack scenes feature those amazing and gooey sound effects as you can hear every piece of flesh ripped off, which I love. Dialogue is always cleanly presented and easy to follow along, and free any pops, cracks, hiss, and shrills. Audio Commentary – Ridley Scott delivers a dry, yet very informative commentary track as he talks about the history of the Alien franchise, making the film, the design of the alien, and working with the new actors. If you like the film, you’ll enjoy hearing about how it was made by the master himself. Deleted and Extended Scenes (HD, 18 Mins.) – There are 12 scenes in total, most of them being extended scenes, including the opening and some more key moments throughout the film. There are no big scenes with alien carnage though. USCSS Covenant (HD, 16 Mins.) – There are three segments here that act as promos inside the film, including a commercial for the new droid that is Walter, virtual therapy sessions aboard the ship, and the crew eating. Fun to watch, but nothing that really adds to the film. Sector 87 – Planet 4 (HD, 9 Mins.) – Three other segments are here, including a still gallery of David’s illustrations of the aliens and bodies he’s come across to examine. There is also a segment that shows what happened to David and Shaw after the events of Prometheus. Then there is a segment that is quite awesome that features David relaying a message to Weyland about the Xenomorphs. It’s a must-see. Master Class – Ridley Scott (HD, 56 Mins.) – This is a four part featurette that focuses on Ridley Scott as he works on the characters, the creatures, the sets, and the story for the film. All are worth watching. Production Gallery (HD, 26 Mins.) – A ton of stills from the concept art, storyboards, promos, and more illustrations from the film to browse. Trailers (HD, 5 Mins.) – Two trailers for the film. 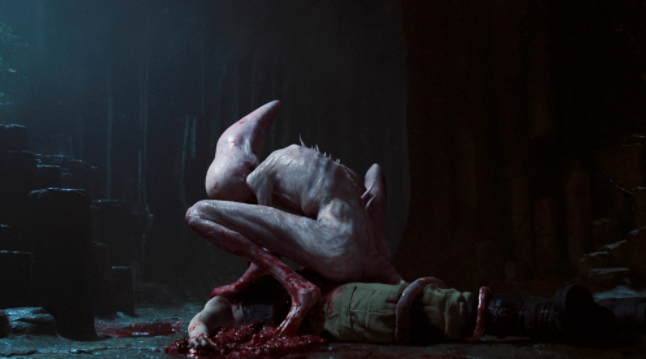 Alien: Covenant is certainly a step in the right direction and is a lot of fun to watch. It’s scary and explains a lot of history of the aliens and xenomorphs, as well as talk about the events of Prometheus. There are some forgettable characters here and there with a couple of memorable ones as well. Overall, the story is coming in place to catch up to the first Alien film, which is down right exciting. The 4K video and Dolby Atmos sound is fantastic, along with some worthwhile extras to boot. With the 4K UHD Disc, the Blu-ray Disc, and digital copy, this one comes Highly Recommended! This entry was posted on Friday, August 25th, 2017 at 10:37 am	and is filed under Film, News. You can follow any responses to this entry through the RSS 2.0 feed. You can skip to the end and leave a response. Pinging is currently not allowed. « Check Out The Trailer and Poster For ‘Brawl in Cell Block 99’!!! [to Seaweed and Penny] Oh, so this is love? Well, love is a gift, a lot of people don't remember that. So, you two better brace yourselves for a whole lotta ugly comin' at you from a neverending parade of stupid. [deadpans] So, you've met my mom?